Prizing and samples are courtesy of Hulu. Curious George has always been a household favorite with my daughter for as long as I can remember. He is super mischievous like she was as a toddler, and most times like adults too. 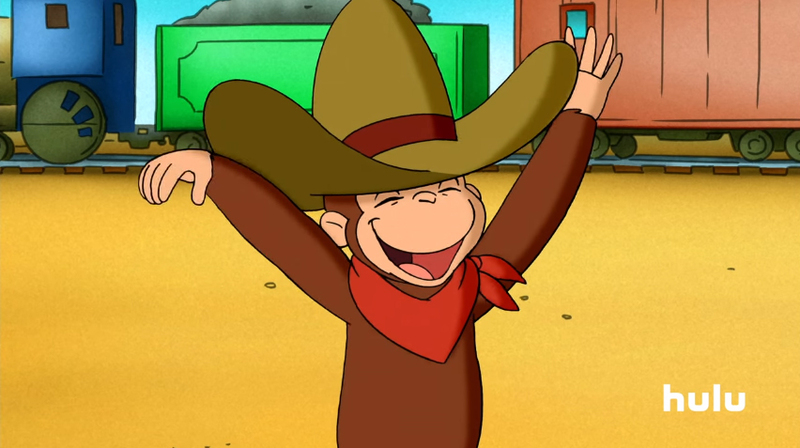 Curious George is an animated series based on the popular books by Margret and H.A. Rey. 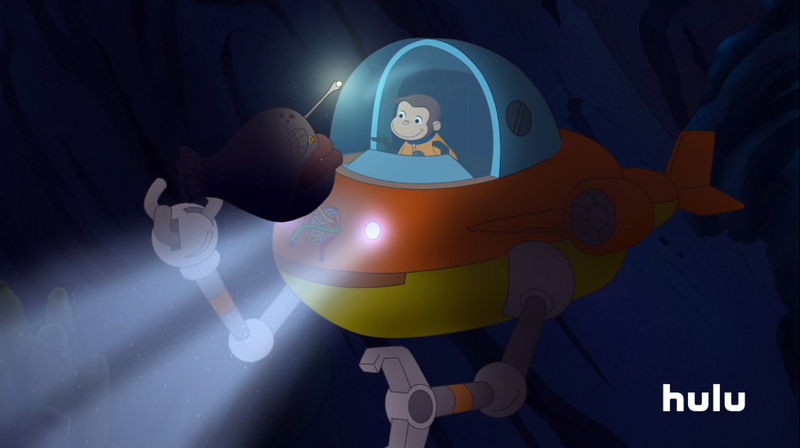 Aimed at preschool viewers (ages three to five), the goal of the series is to inspire children to explore science, engineering, and math in the world around them. And what better guide is there for this kind of exploration than the world's most curious monkey? This show is adorable! It was funny when my kiddo watched it as a toddler because Curious George is like most toddlers! They get into trouble and learn their lessons from it. Hulu is THE streaming destination for the best of TV, and a great selection of films! Plus, you can stream almost anywhere, on any device, including gaming consoles, set-top boxes, tablets, mobile phones, and more. Visit Hulu.com to start a free 1-month trial, for a limited time only. Hulu is available on most internet-connected devices. Examples: Apple TV, Roku, PlayStation, Xbox, Smart TVs, Laptops + PCs and mobile phones like iPhone and Android-operated phones. This means that it can be accessible from anywhere that you have cell data and/ or wifi! For $7.99 a month, the Hulu subscription service offers premium programming anytime with limited commercials. For $11.99 a month, you can watch Hulu’s premium programming with no commercials. And, for an additional $8.99 per month, Hulu subscribers can add SHOWTIME to their subscription. Making Hulu the only streaming destination with SHOWTIME’s service fully integrated into its user-friendly platform. Be sure to visit Hulu on their social channels to stay up to date with the latest. Win it: to celebrate CURIOUS GEORGE- All 9 seasons now streaming exclusively on Hulu, one reader is going to win this giveaway! 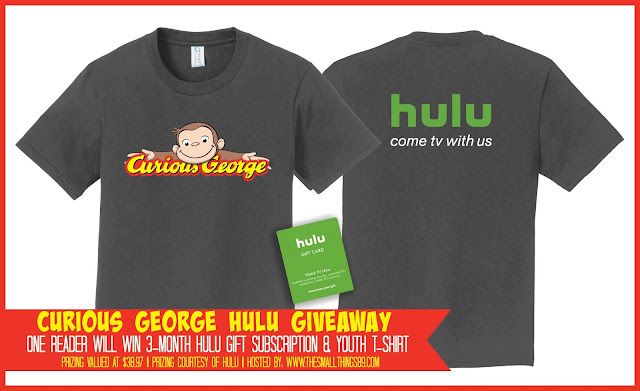 Winner will get a 3-month Hulu gift subscription & Curious George Youth T-shirt. Prizing valued at $38.97. Prizing courtesy of Hulu. Giveaway is open to the USA. Winner will have 24 hour to respond to email claiming prize. All entries will be verified. Giveaway ends 5/9. Goodluck. Yes, I'm excited about this giveaway! I'm excited about winning this giveaway! i am very excited because i love tv. thanks for the chance. I am super excited! My children love George! I am excited about this prize because I have heard really good things about Hulu. Yes, I am excited to win so I can try Hulu and my daughter is a Curious George fan. Very excited! We love Hulu and my daughter can't get enough Curious George! Thanks so much for the chance! Yes, I am excited about the prospect of winning this. Yes, I am very excited about winning this. My kids love hulu. Yes, I'm super excited about this giveaway! I loved Curious George growing up and I'd love to be able to share him with my littles! Super excited because HULU and Curious George makeep the prefect combo! Yes, I am definitely excited! Love all the great fun shows that they are adding on hulu! Im stoked! we LOVE curious george! my daughter is pretty excited too!! I am very excited for the chance to win.